Party Till the Cows Come Home! One of the knitting guilds I belong to, Purls of Distinction, has been "dressing" teddy bears for charity. 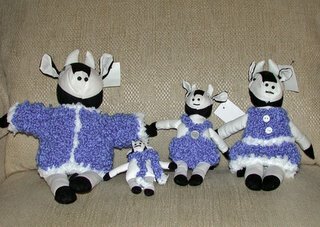 I've already put a sweater on a little teddy bear, but I couldn't resist the "cow family" when Jo Anne donated a bunch of stuffed cows. Then, my friend Elizabeth was trying to get rid of some Caron Simply Soft Boucle. Hmmmm.....I bought some Wendy Snowflake and proceeded to dress my "cow family". The bracelet to the right was custom made for me by Kris (Knitty Chick). It fits perfectly! She also sent me a wonderful CD - we played it last Saturday at the yarn shop. The weather was terrible with torrential rains, but the music on the CD was very soothing and relaxing.....the perfect music to knit by! Thanks so much for the wonderful gifts! 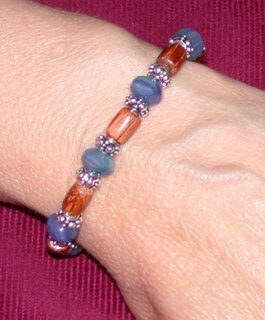 Looking at this lovely bracelet makes me think that I too want to get into jewelry making.....no.....must.....stop .....myself. The stash of yarn and fiber is overwhelming enough.....I don't need to add another "acquisition" hobby to my repertoire! These socks knit up VERY fast...and I love the colors! I used Regia 6 Ply Crazy Color. It's a 75% superwash wool/25% nylon yarn. Again, I used a combination of several sock patterns and used size 4 needles (quite large for knitting socks!). They are nice and soft and fit perfectly!!!! Too bad summer is nearly here - I'm always barefoot! Could be. I need to digress from my usual "fiber related posts" to share a "Proud Mama" moment. Yesterday morning, I was having a lovely day at the Blue Ridge Spinners and Weavers Guild. It was a lot of fun and I met several wonderful people and oggled some gorgeous handwoven shawls, scarves, and napkins. However, the best thing that happened occurred in the middle of the meeting. My daughter called from Michigan State to tell me she'd passed her "Orals", so she's now officially a PhD candidate in Chemistry! Wahoo! I think I'm the proudest mama in the world! She's got 2 years of grad school behind her.....only a few more to go! I am sooo proud! It's been a while since I've posted (waiting on some pictures), so I thought I'd update all on the saga with the "Simply Knitting" magazine at the local Barnes and Noble stores. If you recall, the British magazine, "Simply Knitting", contains a knitting related "freebie" every month. However, it was missing from the March issues at my local Barnes and Noble store (and they merely covered the free gift information on the cover of the magazine with a plain white sticker after I pointed this out to them) . The info desk took a message from me and said they'd let the manager know about the problem and also said that a manager would call me back. No one has called. I e-mailed corporate to let them know about the problem - the automated response said someone would be in touch within 48 hrs. No one has responded. I just picked up the April issue from my local Barnes and Noble.....and guess what! It's properly packaged with the freebie inside the plastic wrap. Wahoo! I don't know if this is the result of my recent complaints to the store and to corporate, or if it's just a coincidence. Either way, I'm a happy camper this month! This months "freebie" is the Sirdar Loopa. It's a plastic "U" that is the tool for making loopy scarves (boas) out of yarn. It's not a knitting gadget, but will allow "non-knitters" to create some of the funky scarves that have been all the rage lately. My First Needle Felting Project! This is my first attempt at needle felting - I made this for my step-daughter's birthday. She's crazy about horses and goes to Virginia Tech (VT), so this just seemed like a natural excuse to learn a new technique! 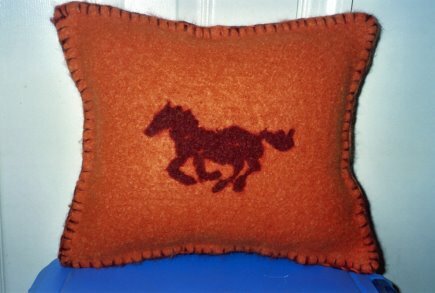 I knitted the pillow out of Lamb's Pride Bulky (85% wool, 15% mohair) in the Orange-You-Glad and Medieval Red color way (as close as I could get to the official VT colors). I knitted the front and back of the pillow separately so they would dry faster and so it would have the same type of edging all the way around the pillow. Finally, I blanket stitched around the sides of the pillow to close up all the sides and stuffed a pillow form inside. It was VERY difficult to get my yarn needle through the felted pillow, so I stabbed one of my metal knitting needles through both thicknesses of felt to "prepare" it for my yarn needle. I still managed to suffer sore fingers for a few days afterwards.....probably because I blanket stitched an entire side without "preparing" the holes! Another lesson learned! I was quite pleased with how this turned out and plan to do more needle felting - it's a great way to decorate/embellish felted bags! Wow...what can I say. Knitters are some of the sweetest people you'll ever meet. Knitty Chick, a very talented knitter/felter, sent me these wonderful sterling silver stitch markers that she'd made - it's not my birthday or anything! She makes jewelry, as well as knits and felts.....is there anything she doesn't do???? Thanks so much Knitty Chick! You're the greatest! PS - don't forget to check out her blog (link on the right of this page) - she's made a gorgeous felted crochet bag! Have I mentioned that I love hedgehogs? I think they're soooo cute. I guess I can blame it on Beatrix Potter (Miss Tiggy Winkle is just so adorable) as well as my favorite Norwegian knitting store - Pinnsvin Design. They have hedgehogs as their "mascots". I love this store - I ordered from them a few years ago because I wanted a book on Norwegian Rosemaling as well as those lovely pewter buttons that are found on the Norwegian sweaters. At the time, it made more sense (choice and cost wise) to order these directly from Norway....plus, it enabled me to make more knitting friends! 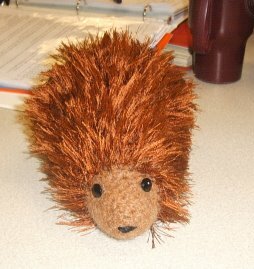 I finished this little guy just in time for our Knit Knutz meeting yesterday. My friend Elizabeth just happened to have her digital camera with her and snapped a couple of pictures for me. She's such a sweetheart! Things felt better "unstuffed" so the friction can do its work on both inside and out.